In 1939, Gustav Brunn fled Germany and then developed the Old Bay crab seasoning - celery salt, peppers, paprika and secret spices - in Baltimore. 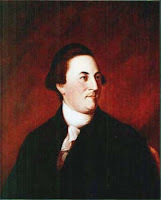 Some spices used in 1800s Maryland recipes were nutmeg, salt, pepper, cayenne pepper, mace, cloves, and allspice. 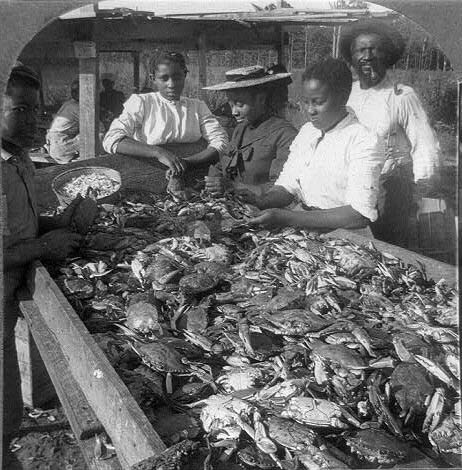 Photo of 1906 crab pickers. Jane Howard (Mrs. BC), included several crab recipes in her cookbook Fifty Years in a Maryland Kitchen, 1873: two crab stews: one a cream sauce with mace, cayenne, salt & pepper the other with mustard, cayenne pepper, cloves, allspice and wine. Crab omelet, fried soft crabs and Crab Olio (fried with eggplant and tomatoes). Three were in the previous work by Mary Tyson, Queen of the Kitchen, 1870 which had ten crab recipes. Mrs. Charles Gibson's Maryland and Virginia Cookbook of 1894 had seven recipes, one soup named for her home Ratcliffe Manor in Easton on Maryland's Eastern Shore. "Take out the meat and clean it from the Skin. Put it into a Stew-pan with half a pint of white wine, a little nutmeg, pepper and salt, over a slow fire, - throw in a few crumbs of bread, beat up one yolk of an egg with one spoonful of vinegar, then shake the Sauce pan round a minute, and serve it upon a plate." Pick the crabs carefully. Season with powdered mustard, cayenne pepper, two or three cloves, a very few allspice, the yolks of two eggs, and a small quantity of wheat flour rubbed with two large table-spoonfuls of butter; to which, if you like, add two glasses of white wine. Mix all together, and stew for quarter of an hour. Pick the crabs after they are boiled. To a pint of crabs, put a gill of cream, two ounces of butter, two blades of mace pounded, salt, cayenne, and a little black pepper. Simmer for half an hour. Take off the back of the crab, and remove the dead flesh. Then put some lard in a frying-pan, and, when perfectly hot, put in the front part of the crab. When done, take it out, and rub it with a little good butter, and a very small quantity of cayenne pepper mixed with it. Then fry the back of the crab. Unite the two parts and serve them. Boil one large egg-plant; scald half a dozen large tomatoes, and skin them (use more if they are small). Drain them on a sifter, until the water is out of them. When cold, chop the egg-plant and tomatoes together, with the meat of three or four crabs. Beat three eggs and mix in with the other ingredients; also pepper and salt. First fry it in a skillet, with a table-spoonful of butter, then brown it in the dish in which it is to be sent to table, with crumbs of bread. Take six large crabs; boil and pick them; then beat twelve eggs, fifteen or twenty minutes. Season them with pepper, salt, parsley, and thyme. Mix all together, and fry them in butter. Egg-plant and tomatoes can be added when they are in season. Asparagus, cut fine, is very good, instead of crabs. To Bake or Devil Crabs. 208. Boil the crabs, and pick them carefully, removing all the shell, and the dead man. Boil some salt in the water; and before putting them into the pot, see that each crab is lively. After picking the crabs, clean the shell nicely, and then return the picked crabs to the shells; put them in lightly; season with pepper, salt, and butter, and strew bread crumbs over the top. Be careful not to pack the crab in the shell, for it gives it a clammy taste when cooked. Put them in the oven, and when they become a light brown, take them out, and set them aside to cool. Use in boiling 1 cup of vinegar to 12 crabs. 209. After boiling the crabs, pick them carefully, and serve the crabs cold with salad dressing, and lettuce. 212. A large table-spoon of butter creamed with mustard; salt and pepper to taste, a little vinegar, and 2 eggs beaten light. After mixing it all together, put it on the fire, and stir it until it becomes the consistency of custard. 883. Soft crabs are very delicious if pickled. Clean the crabs, and boil them in salt and water until they are done; take them out, and let them drain; when perfectly cold and dry, put them in a jar; pour over them vinegar until they are covered. First scald the vinegar with spices, and then let it become cold before adding it to the crabs. Hard crabs can also be prepared in this manner. 451. Boil and pick the crabs; put them in a dish, upon leaves of lettuce, and pour over them a salad dressing. Serve lobster in the same way. 136. Boil a quart of milk, and thicken it with a table-spoon of flour, rolled in butter, pepper and salt. Boil and pick 8 crabs, and when the milk comes to a boil put in the crabs. Just before serving, stir in a cup of cream. Let the soup boil for 20 minutes after adding the crabs. 139. Wash and cut fine 1/4 peck of gumbo, 12 large tomatoes cut fine, 2 onions sliced, 1/2 pound of a green pepper; cut fine, and brown the onion, gumbo, and pepper. Put all the ingredients into a pot with 3 pints of hot water, 1/4 pound of butter, salt to taste. Let it simmer slowly 3 or 4 hours. Boil and pick 12 hard crabs, and add to the soup a half hour before serving. If the soup is too thick, add a little boiling water before putting in the crabs. Marietta (Powell) Hollyday Gibson (1838-1914) wrote Mrs. Charles H. Gibson's Maryland and Virginia cook book which included crab soups, "boild crabs", soft crabs, "devilled crab" and crab croquettes. One quart of picked crab, discarding all fat. Take one pint of water, add four pieces of mace, one onion cut in half, so it can be taken out (not served with the soup), three blades of parsley, a little red pepper and salt. When it boils, add the crab, with one large iron spoonful of butter mixed with two tablespoonsful of flour. Stir in the crab, then add one quart of cream or rich milk. Let it come to a good boil; serve hot. Milk must be very fresh and sweet. Pick the meat carefully and chop fine, leaving out the fat. Season with cayenne pepper and salt, and to a dozen croquettes a large iron spoon of butter, a little rich cream; add two well-beaten eggs. Mix all up. Make in forms of croquettes and dip in cracker and egg, and boil in very hot lard. Everything is better boiled than fried in lard. It is best to use a wire frying-basket, so they will not break up. Gustav Brunn (1893-1985), a Jewish immigrant from Germany, developed a combination of spices to form the crab seasoning. Eventually it was named "Old Bay" from the nickname of a steamship company, and its package was styled after the steamship line's lettering. The secret recipe was bought by the Baltimore spice company McCormick in 1990. Old Bay Line steamships, charted as the Baltimore Steam Packet Company by the state of Maryland in 1840, operated until 1962.